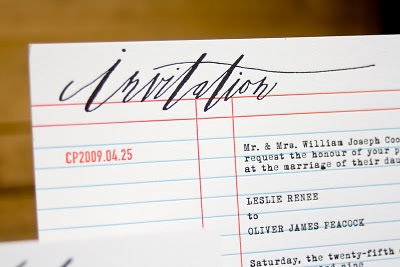 Hammerpress is featured on the Martha Stewart Weddings new blog column called "From the Stationary Files. Very very cool. An index card featuring the Dewey Decimal, a typewriter, and calligraphy from Betsey Dunlap... yes please! i dig. So creatively, class-ily, inexpensive and awesome. This is definitely a piece that people can create at home. We wouldn't have Betsey's awesome handwriting pressed into the paper, but that can easily be replaced with another, or even a stamp. It makes me want to fix my typewriter that much more!